A 7-Scenario Pack dedicated to the members of the American-Canadian First Special Service Force and their actions in the Anzio Beachhead during the early part of 1944. The FSSF remained in combat for 99 days straight without relief, during which it conducted a highly aggressive patrolling strategy that was so effective, the Hermann GÃ¶ring Division that was in the line across the Mussolini Canal from them, was forced to pull back its front line 1,000 metres and its commander offered a 10-Day furlough to any German who captured one of Die schwarzen Teufel "The Black Devils". 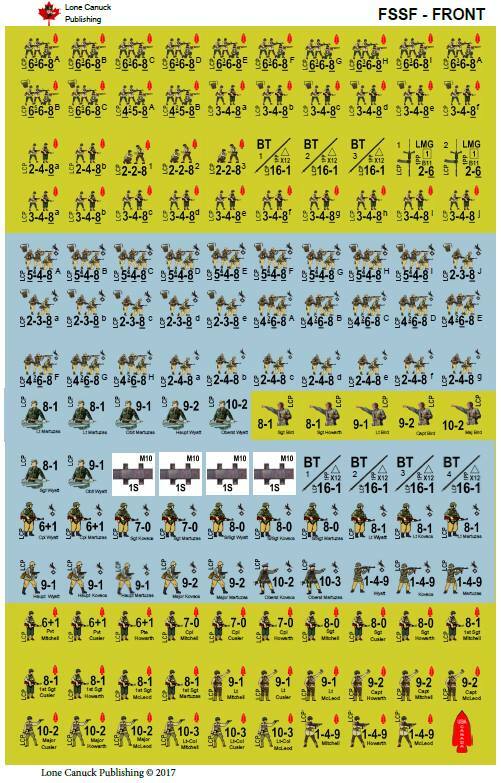 Requires ASL Map Boards : 4, 16, 33, 43, 48, and ASL Start Kit Map Board "t"
A small 5Â½-turn Night scenario featuring, Germans : 2x Squads, 2x Crews, 1x Leader, 2x HMG, and some fortifications ; Americans : 6x Squads, 2x Leaders, & Raid selected SW.
WCR-2 7th Luftwaffe’s Attack : The Germans launch a night attack, attempting to bridge the Mussolini Canal ; led by members of the 7.Luftwaffeabteilung zur besonderen Verwendung, a unit made up of Luftwaffe personnel serving out their court-martialled sentence on the front line. A medium 8Â½-turn Night scenario featuring, Germans : 11 Squads, 2x crews, 3x Leaders, SW, & Foot Bridges ; Americans : 4x Squads, 3x HS, 2x Leaders, SW, & Fortifications. WCR-3 Raid at Sussuno : In effort to draw the Germans’ attention from the hard-pressed US 45th and 3d Divisions to the west, the FSSF launched a raid against the German position at Sussuno. A medium 7Â½-turn Night scenario featuring, Germans : 4x Squads, 4x crews, 2x Leaders, 2x HMG, 2x 81mm Mortars, & fortifications ; Americans : 9x Squads, 1x HS, 3x Leaders, & Raid selected SW.
WCR-4 Hold at all Cost ! : The Germans launch Untemehmen Fischfang (Operation Fish Catch) attempting push the Anglo-American beachhead back into the sea. The attack struck the FSSF position near the split of the Mussolini Canal, was led by the tanks, assault guns, and pioneers of the Hermann GÃ¶ring Division. A medium 8Â½-turn scenario featuring, German : 10x Squads, 4x HS, 2x crews, 3x Leaders, SW, foot bridges, 2x Pz IIIL, 2x Pz IVH, & 3x StuG IIIG ; Americans : 6x Squads, 2x HS, 2x crews, 2x Leaders, SW, MG Bunkers, fortifications, & 4x M-10 GMC. WCR-5 Raid at Cerreto Alto : The BIG scenarios of the module ; the FSSF, joined by the tanks of the US 1st Armored Regiment and vehicles of the 81st Reconnaissance Battalion, launch their first daylight raid in the Anzio Beachhead. The raid struck at first light and before the Germans knew what hit them, withdrew, leaving the Germans once more cursing Die Schwarzen Teufel. A 8Â½-turn scenario featuring, German : 15x Squads, 6x crews, 5x Leaders, SW, 1x 88mm Flak Gun, & fortifications ; American : 9x Squads, 2x HS, 4x Leaders, SW selected SW, 5x M5A1, 2x M3 GMC, 3x M4A1 Shermans, 2x M8 Greyhound, & 2x Jeeps. WCR-6 Raid on Litoranea : Worried about the growing German defensive strength, the FSSF along with the familiar Sherman tanks of the 1st Armored Regiment launched a series of raids against the Hermann GÃ¶ring Division positions. A 6-turn scenario featuring, German : 7x Squads, 2x crews, 2x Leaders, SW, & fortifications ; American : 9x Squads, 1x HS, 3x Leaders, Raid selected SW, & 3x M4A1 Shermans. WCR-7 A Primed Situation : With the Germans still in disarray as a result of the FSSF brazen raids, the commanding officer Brigadier-General Frederick, thought the situation primed to pay another visit on their familiar foe, the 7th Luftwaffe Battalion. A 7Â½-turn scenario featuring, German : 8x Squads, 2x Leaders, MGs, fortifications, & 2x Flakwagons ; American : 6x Squads, 2x Leaders, Raid selected SW, & 3x M4A1 Shermans. Available right now from Le Franc-Tireur website! © Le Franc Tireur 2011 - Design based on Pollination from CSS Templates.